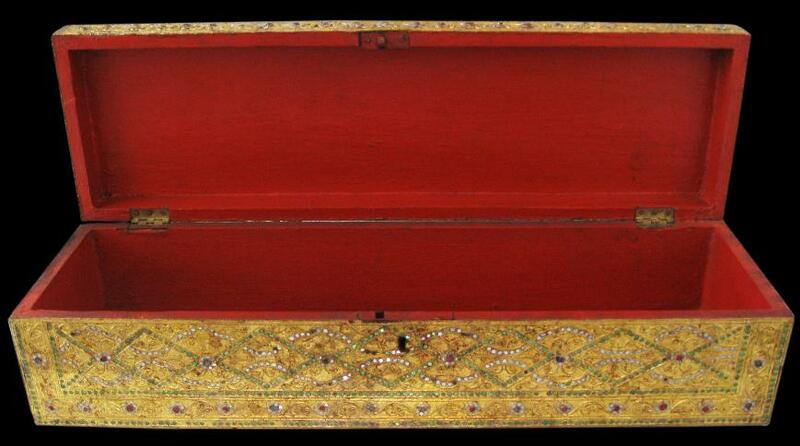 This manuscript chest or sadaik is of typical long, rectangular form with a lift-up, hinged lid. It is decorated with gilded lacquer on all sides. The lacquer is inset with glass roundels backed with red, green and silver foil (known as hman-zi- shwei-cha) and further decorated with moulded relief work (known as thayo) in a variery of motifs including the acheik (wave) and dha-zin-gwe (orchid scrolling) motifs. The interior is in red polychrome. The moulded relief flower designs employed on the chest suggest that the chest may have come from the Shan states in eastern Burma. The chest is in remarkably good condition with little or no loss to the lacquerwork. Lowry, J., Burmese Art, Victoria and Albert Museum, 1974; Fraser-Lu, S., Burmese Crafts: Past and Present, Oxford University Press, 1994; Fraser-Lu, S., Burmese Lacquerware, White Orchid Books, 2000; Isaacs, R., & T.R. Blurton, Burma and the Art of Lacquer, River Books, 2000; Conway, S., The Shan: Culture, Arts & Crafts, River Books, 2006; and Contadini, A., Objects of Instruction: Treasures from the School of Oriental and African Studies, SOAS, 2007.